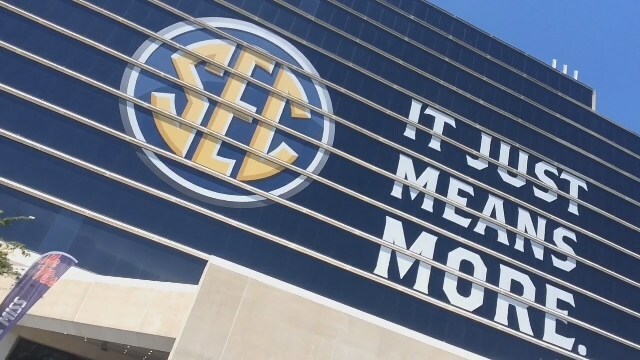 HOOVER – This year’s SEC Media Days wrapped up today in Hoover, with Ole Miss, Auburn and South Carolina taking center stage. New voices step behind the microphone for coverage of SEC Football on television. At CBS, Brad Nessler takes over the play-by-play role after Verne Lundquist retired following 17 years of calling the SEC on the national network. Nessler will join Gary Danielson. Both worked together in the past when they were at ESPN. A new crew will be seen and heard in the SEC Network's prime time every Saturday. Tom Hart will describe the action with Jordan Rodgers and Cole Cubelic analyzing each play. Cueblic is a former Auburn player and hosts a morning talk show on WUMP-AM in Huntsville. The SEC Network has not announced where Hart, Rodgers and Cueblic will be for the opener. CBS' coverage of the SEC begins on Sept. 9 when Nessler and Danielson will call the TCU-Arkansas game. South Carolina's Jake Bentley is a veteran with seven starts at quarterback, but is just a sophomore in class. Bentley stood his ground, leading the Gamecocks to four victories when he took over the position and helped the team become bowl eligible last season. Bentley bypassed his senior year at Opelika High School for early enrollment at South Carolina. He is one of the youngest, at 19, of all starting signal-callers in the conference. When Auburn coach Gus Malzahn arrived at Media Days Thursday, he was greeted in the lobby of the Wynfrey Hotel by plenty of Tiger fans, including a live animal. A dog, whose name is Tiger Jake, waited for Malzahn to come by and autograph its vest. Tiger Jake is a Maltese, and with dyed hair, bears Auburn's colors of orange and blue. Tiger Jake appeared to feel right at home, even taking the opportunity to sit in the lap of Senior Bowl executive director Phil Savage, who is also the analyst for Alabama football on the Crimson Tide Sports Network. That drew a lot of attention. Ole Miss quarterback Shea Patterson is handling the upcoming season as well as possible, knowing the Rebels will be done playing on Thanksgiving night against Mississippi State. The Rebels chose to take a bowl ban for 2017 as they continue to be investigated by the NCAA for potential wrongdoings. "Right now, we are worrying about what we control. We show up working out and being the best version of ourselves every day. We are looking forward to Sept. 2. Anything else beyond is kind of irrelevant for us right now," he said. Patterson started the final three games for the Rebels last season, which puts him behind the number of games played and started by South Carolina's Jake Bentley (seven). The SEC announced it will release its predictions of conference and division title winners on Friday, along with its pre-season all-conference selections. This is the first time the conference has changed the format after receiving votes by members of the media.